The tale of an estate agent who seems to have everything – great body, great flat, great job, OK, so his cleanliness routine and rearranging of beauty products is a little over-keen, but there’s no time to dwell on that as we follow him first to the office, then the property he’s showing that day. Soon, as well as the attractive kitchen and spacious lounge, he’s showing prospective buyers – and colleagues – the stairway to heaven. Find out the whys and wherefores for yourself, but the clue’s in the title. And apart from a bit of stunned wandering by our man, that’s it. There’s no twist, no meeting with justice . . . I can only assume the point of the film has already been made. Something about the way people live for their job, and others die for it? I dunno. It’s stylish stuff, professionally put together in a post-Taggart way, with a brooding score by Mike Hewer. 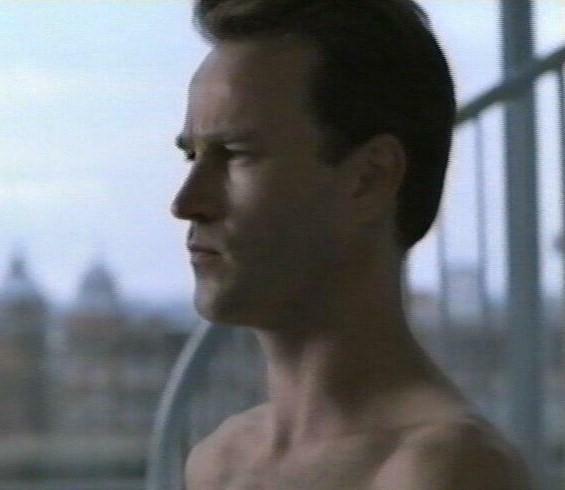 Man-on-the-edge Stephen Moyer does intensity well and looks lovely naked. But it leaves the feeling that part two should follow after these messages. And despite my grasping for meaning, I’m afraid the message eluded me. The only real question I’m left with is: why the heck does this have the BBC Scotland Comedy Unit stamp on it? It’s true that the likes of Still Game and Chewin’ The Fat rarely put a smile on my Sassenach face, but I can usually see that some attempt at humour is being made. Despite a couple of sharp lines, and a cameo by the inevitable Ford Kiernan, this seems to be drama all the way. We haven’t been able to find it, there is a short clip on You Tube however.